Hello, my name is Jeff Richmond and I’m the Director of Instruction for Consistent Golf. I want to congratulate you on taking the 2 minute golf swing test. Taking this test was one of the best things you could have done for your golf game because these results are going to confirm whether you have one of the worst swing faults in golf… or not! 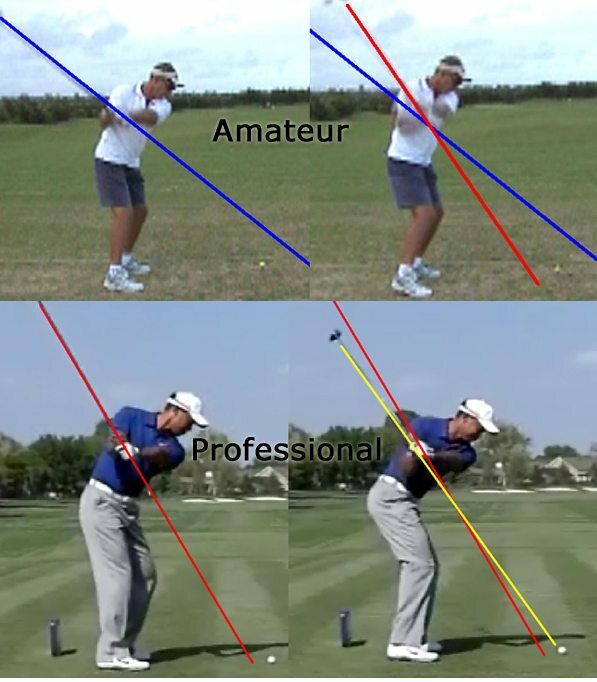 Here are a couple of examples of professionals you may have heard of showing you the correct backswing plane. 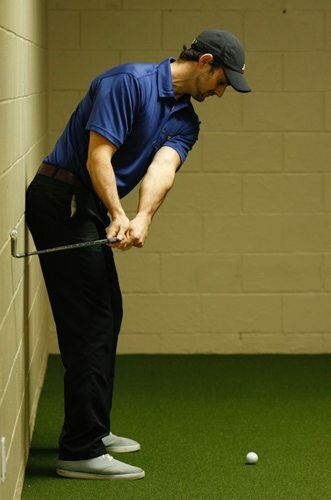 Now when you completed this swing test, if at the half way point in your backswing you were a long way away from the wall like this….then your swing plane is way too upright. Conversely, if you hit the wall well before your left arm was parallel with the ground like this… then your swing plane is much too flat. Now that wall swing test I got you to complete would for most people have given them a good indication as to whether or not they have a backswing plane problem. And if you did fail the test it will lead to a downswing plane problem which WILL cause great ball striking inconsistency (more on that in a few minutes). These amateur golfers are demonstrating the REVERSE of what should happen in a good golf swing. Because at the halfway point in the downswing the club shaft should be pointing very close to the ball and the backswing and downswing planes should be very close to each other. That’s what I call the consistent swing plane. 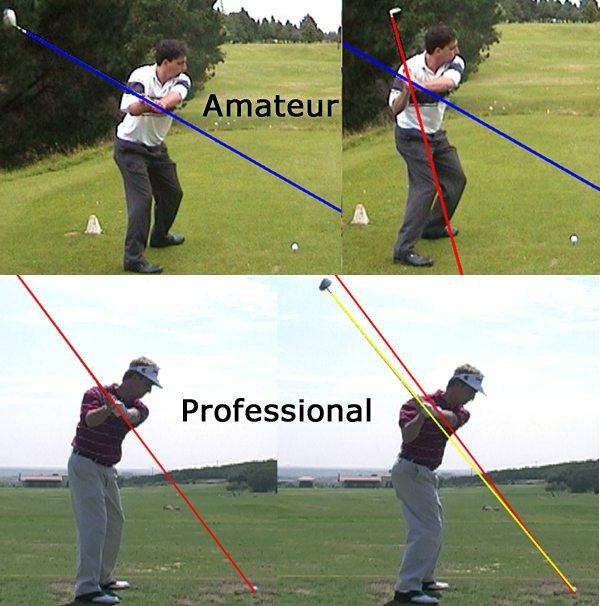 Clearly, the backswing and downswing planes of the professionals are so much closer together (compared to the amateurs) as you can clearly tell by the pictures above. Simply because the correct swing plane (i.e. what pros do) is the reverse of what is natural. 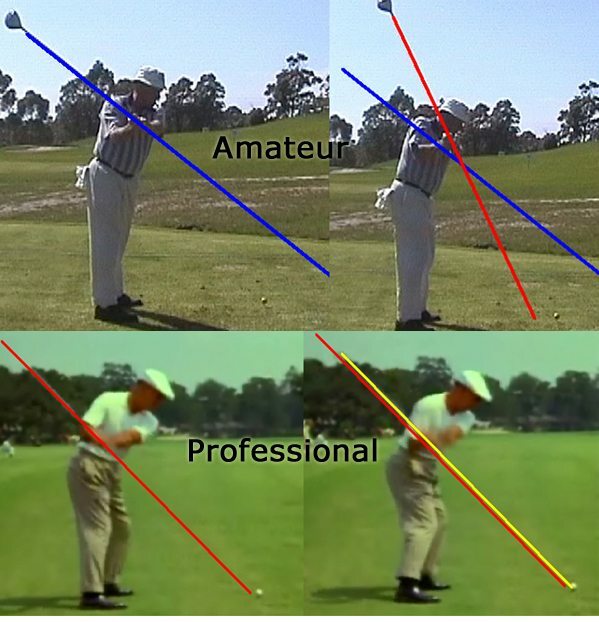 Ben Hogan – one of the greatest ball strikers of all time! 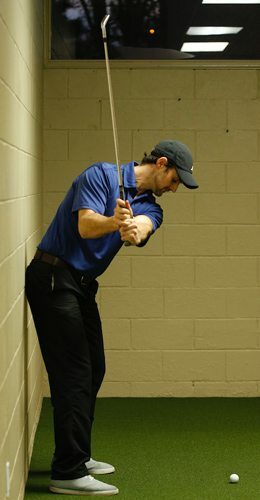 It’s not uncommon for golfers to work on their swing planes. 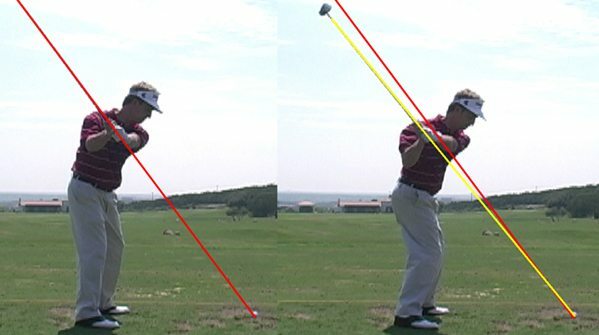 But very few make any improvements doing it, because the swing plane can be a very confusing topic… and most golfers get bogged down in theory. 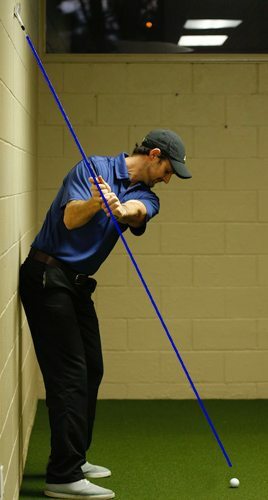 It’s because of these reasons I decided to create a simple plan that golfers could follow to improve their swing plane and as a result they would hit the ball longer and straighter than ever before. On the right of this page you’ll see proof from golfers that have followed this plan already. Look, if you’re lacking ball striking consistency, your inconsistent swing plane will be the major reason for this. And that’s why I decided to share this knowledge with golfers…. to make golf more simple and fun. My simple 3 step program has been designed specifically to teach you how to get your swing plane to be like that of a PGA Tour Pro. This automatically will have you hitting the ball longer, straighter and more consistently. The first thing you need to do to have a swing plane like a pro is to take the club away on the correct plane. That’s why in the first step of this program I give you 3 drills to help you start the swing properly with the correct parts of your body. When you’re doing these drills you’ll get instant feedback, so you’ll know whether you’re doing them correctly or not. You can do all of these 3 drills inside at home and you can do all three drills in about 10 minutes per day. Then on pages 15 – 19 you get the absolute best drill to groove an on-plane take-away. Again, like the first 3 drills, this drill can be done inside at home. Plus you’ll find this drill very interesting and almost addictive. You also get a video showing you this drill so you’ll know exactly what to do. This drill takes less than 5 minutes to do. On pages 22 – 29 you’ll see how to get your backswing plane to be like that of a pro — in the quickest possible time. Important Note: If you have an over the top swing problem (which most amateur golfers do), Step 2 will help you to fix it within 5 minutes! And I have not seen the secret I reveal on pages 25 – 27 mentioned anywhere else. And when you learn that one secret you’ll suddenly realize why you’ve struggled to change or improve your swing for so long…. and why nothing else has or would’ve made a big difference to your golf swing. On pages 36 – 37 of this program you get a drill that you can do inside, at home, in less than 5 minutes, which lets you feel the one move that truly separates the great ball strikers from the average. And two professional golfers that visibly do this secret move are Nick Price and Sergio Garcia. 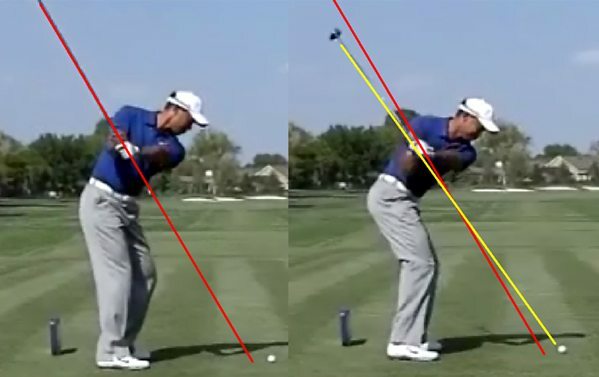 But every pro golfer does this secret move to some degree, but those two are noticeable to the naked eye. Naturally, once you learn and perfect this move, it will make a massive difference to the length and accuracy of your golf shots. 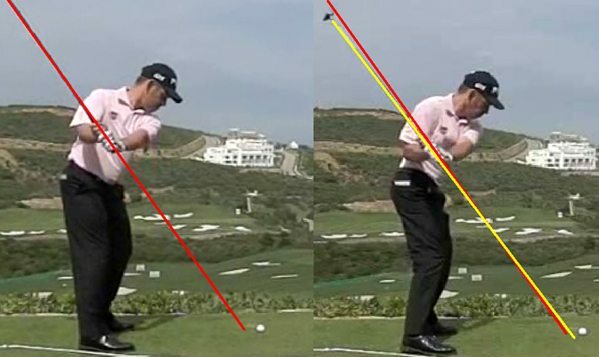 And again, this secret move actually is what separates great ball strikers from average ones. Then on page 39 I show you (with the use of lots of pictures) how you can check when you have completed Step 3 successfully. So as you’re sitting there reading this, imagine grooving a consistent golf swing plane so you easily hit the ball 20, 30 or even 50 yards further than you are now. And imagine hitting drive after drive consistently down the middle of the fairway…. just like a pro. Now picture in your mind’s eye…. …hitting green after green in regulation, and getting more pars and birdies than you ever have in your life. And see yourself after your next game of golf writing on your score card the best score of your life. Picture the expressions on your playing partners faces when you start hitting the ball longer, straighter and more consistently than you ever have before! That’s all possible when you groove your swing plane to be like a pro. And that’s what I’m going to get you to do in my special 3 step program. You’re going to get all the instructions, drills, pictures and videos to check that you’re doing each step correctly. Then at the end of each step of the program, I explain exactly how you can check to make sure you’ve successfully finished that step. Once you’ve successfully finished each step, then you simply move onto the next step of the program. And you keep repeating this process until you’ve finished all 3 steps of the program — at which point you WILL be hitting the ball longer, straighter and more consistently than ever before – 100% guaranteed. So I imagine you want to make your swing plane just like a pro’s as soon as possible. That’s why I have packaged this program up into a digital format for immediate delivery. This way there are no shipping costs. And you don’t have to wait days for everything to arrive to your door — so you can start to improve your swing plane in just 5 minutes from now! But if you want to get the hard copy version of this swing plane system you can choose that option from the order form below. I honestly believe that if you complete the 3 steps in this program, you WILL be hitting the ball longer, straighter and more consistently than you ever have before. And I believe that so strongly, that I’m going to give you a completely no risk, no questions asked, 100% money-back guarantee. If you are not hitting the ball longer, straighter and more consistently after completing this program… or you’re not happy with it for any reason…. just let me know and I’ll refund 100% of your purchase, no questions asked…. anytime within 60 days of your purchase today. In other words, there is no risk on you whatsoever. Look, I’m taking all the risk… and all of the responsibility for you, so… you’re free to focus on grooving your swing plane to be just like a great pro. It’s taken me many hours of study and testing, to not only find out the best swing plane, but how to teach this so any golfer can have a swing plane like a pro. And when I teach a golfer in person to have a consistent, professional swing plane it generally takes 5 lessons for them to get it and each lesson costs $100. So they don’t get any change out of $500. But because you can do the program at home, in your spare time obviously I am able to offer it to you at a much cheaper price than that. And even though this program is worth $500 like my students pay me, I’m not going to charge you that amount to groove a pro swing plane. Instead, I’m going to let you get this program for just $99 for the physical version or just $47 for the digital version that you can get straight away. Plus, if you order this program right now I’m going to offer you something that is strictly limited and worth a lot more than a one time fee of $99 for the physical version or $47 for the digital version. Order This Program Right Now And You Get Personal Video Coaching From Me For FREE! If you order this program right now you can email a video of your swing after you have completed each step and I will give you confirmation whether you have passed the stage or not. So you get 3 free video critiques when you order this right now. I charge $75 per critique which means this is a very real $225 bonus. If you come back here tomorrow and this bonus is not here any longer then I’m sorry, you’ve missed out on this bonus. I will of course, honor this bonus to all of those golfers that have already purchased it. BUT that’s the bad news. 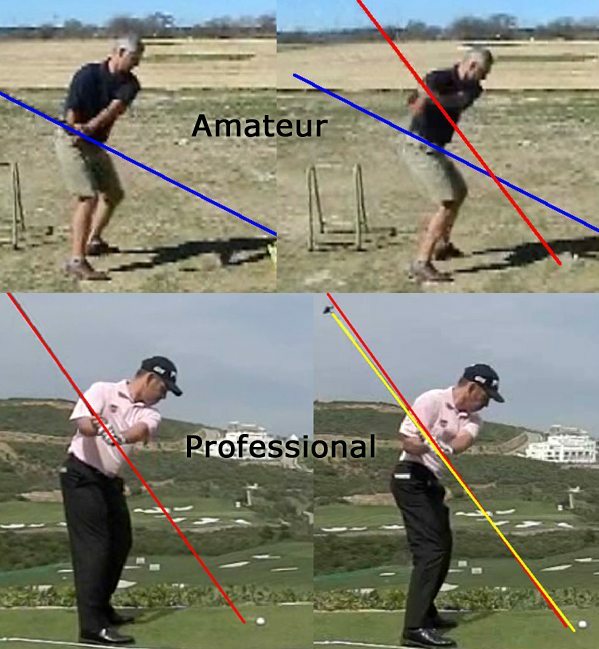 The good news is that when you fix your swing plane problem, you will…. How exciting will it be when you do that?! But the only way that’s ever going to happen, is if you get this 3 easy steps to a professional swing plane program right now and then start to follow the steps and groove a professional swing plane. And when you complete each step successfully — you’ll hit the ball straighter, more consistently and longer than you ever have before. And remember, that’s completely guaranteed. So… you will be hitting the ball longer, straighter and more consistently after completing this program or you get a refund. When you look at it that way, it makes total sense to get this program right now! After you’ve successfully processed your order, you’ll be directed to a page to download the program straight away. Now if you don’t get this program right now, you’ll probably always have swing plane problems — and you’ll never hit the ball as well as you hoped or think you’re capable of. You’ll always feel frustrated with your ball striking. And if you leave without ordering right now you’ll probably get busy and forget about this until the next time you’re frustrated on the golf course with your lack of consistency. But by then the price might have gone up or the free swing video critiques worth $225 might have been taken away. Aren’t you sick of hitting the ball so short and wildly? And aren’t you sick and tired of people looking at your ball striking as some sort of joke? But imagine the looks on their faces when you start hitting it past them! And imagine your ball being consistently the longest out of your playing partners — this can happen FOR YOU! Just imagine how much more happy you’d feel, hitting the ball consistently better and longer. Imagine how much more confident you’d be as a result. And imagine how much more respect you’d get when you gain 20, 30 or even 50 yards in distance. Well, that will never happen…. unless you groove a swing plane like a pro. For a measly $47 (for the digital version) you could gain a heck of a lot of distance and enjoy playing golf so much more. And besides, you could easily save that amount in a few games of golf by not losing so many balls! To start hitting the ball longer, straighter and more consistently click here and choose the approprite ordering option for you. Look, life is too short to be frustrated with your golf game. The time to take action is now. It’s now your turn to groove a professional swing plane now. Start right now so that in your very next game of golf you are hitting the ball longer, better and more consistently. And with each successful step, you’ll only improve even more. Your Poor Swing Plane Could Be The Only Major Swing Fault Holding You Back From Great Ball Striking Consistency And Success! But you’ll never know unless you get this program right now. And besides, it doesn’t matter how much you spend on getting a new driver, or new golf balls, or whatever, because if you have a swing plane that is not like a pro — you’ll never improve much. The fact is…. unless you groove a professional swing plane, you’ll always be dreaming about how good you could hit it. Stop dreaming and start doing! Take action now and click here to get this program and start improving your swing in just 5 minutes from now! P.S. Please don’t put off getting this 3 step program now, because we both know how fast 60 days goes by. And when you get this program now you could start grooving a professional swing plane within 5 minutes from this very point in time. Then within 60 days you could make a huge, positive difference to your ball striking.